One day last fall, my neighbor from across the street stopped me to say how much she liked the Autumn Blaze maple in our front yard. Her son had recently commented that it was the biggest tree on the street, she said, and they really enjoyed watching it turn red in the fall. Her comments were nice to hear, but the truth is that I had not noticed. I had not really noticed how big the tree had gotten or how lovely it looked with the top leaves a deep burgundy red and the lower leaves still green, and how really, really red it got at the end of the season. That’s a great looking tree — especially for the neighbors! Garden designers often talk about views and considering the views your yard and garden offer from various positions–both inside and outside the house. Sometimes the best positions for viewing are across the street. Like many newer homes, the windows on my house are largely oriented toward the back, so the view I see most of the time–while doing dishes or sitting at the dinner table or reading in the living room–is a view of my backyard and my next door neighbor’s backyard. When I look out the two larger windows at the front of the house, the part of the big maple that I see is the trunk and a few lower branches. 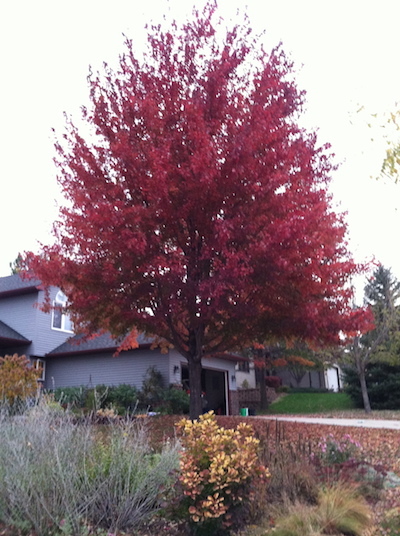 I enjoy its shade, but the aspects of the tree that make it beautiful–its nice round crown, the way its leaves flicker in the wind, and its deep red fall color–are not part of the views I normally experience. To see those things, I have to step back and look up. Like many gardeners, I’ve reached the end of the gardening season with thoughts of next year dancing in my head. But before I commit any of those plans to paper (or start digging), it’s time to step back, look up, and consider new points of view.